This full-color hardcover book contains two volumes. Volume 1 (the first 100 pages) is a refresher if you haven't played in a while or if you are a complete novice. Once you've mastered the skills in Volume 1, you will move on to Volume 2. There you will hone your play to become an advanced player. AUTHOR: I was addicted to it in the seventies and continued to play often in the ensuing years. I joined clubs, started clubs, played in chouettes, read whatever I could find. After moving to Santa Fe, I joined the Backgammon club of Santa Fe. I headed up to my first ABT (American Backgammon Tour) tournament in the Fall of 2009. I decided to play in the Open and thanks to some backgammon street smarts and very kind dice gods, I went on to finish second against an outstanding field of backgammon giants. More than that, I was re-hooked into this exciting game but realized how much it had changed in the past twenty years. Players could now analyze games and positions with powerful computerized backgammon programs that didn't exist in the seventies. "Correct plays" from the seventies had to be re-examined. Thus began my journey. Much of this book is an outgrowth of that discovery process. 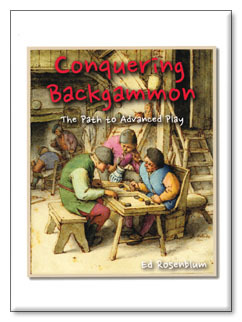 Teaching backgammon for many years has helped me understand what students can learn easily and what is more difficult. Using eXtreme Gammon, I analyzed thousands of positions and categorized them into critical playing concepts. These concepts were continuously refined based on student feedback and then factored into underlying principles.